I try to visit the city every few years. This year I was able to squeeze in a combination of classic Christmas activities along with some new adventures. For part of the time I stayed in Brooklyn with my good friend Veronica and her fiancé Alex. Veronica and I met in Teach for America and actually co-taught our first year. They recently bought an apartment in Prospect Heights, so it was fun exploring their neighborhood. The rest of the time I spent in the city with my friend Nuni, whom I met in college while studying abroad in Turkey (so many stories there). The weather was freakishly warm this year. It was nice being able to stroll the streets without fear of frostbite, but at the same time it was a little weird to see the city without its usual layer of December snow. I spent a lot of time in the lower portion of the city. I stumbled on the Christmas tree in Madison Square Park on my way to one of my favorite bookstores: Rizzoli. I’ve always loved the New York City Public Library. At Christmas the signature lions are all decked out for the season. Nuni humored me and spent a day strolling the city visiting all the lights and storefronts. There is something magical about Christmas lights! Saks 5th Avenue’s Winter Palace themed windows were stunning, but not as stunning as the light show they’re doing this year. Cops were blocking off the street to control the crowds. It felt like Disneyland. There are so many skating rinks in the city, but Bryant Park is still my favorite. The cute shops that surround it are fun to browse and it’s not nearly as crowded as Rockefeller Center. Beyond the standard holiday activities, I also explored a couple new-to-me destinations. Since I left New York, the Whitney Museum has relocated to Chelsea in a gorgeous new building by the water. I stopped by to check out their Frank Stella exhibit which was incredible. The Whitney’s new building is also a work of art in itself. Everything from the outdoor vistas to the staircase were intentionally designed and just beautiful. I walked the expanded section of the High Line after grabbing a coffee from a new-to-me coffee roaster: Blue Bottle. Smiling in spite of the blisters on my feet. I should have known better than to bring new boots. Veronica and I stopped by the Brooklyn Library for a quick visit. The entryway is majestic with its gold columns. I’m jealous this is where she checks out her books every week. The Brooklyn Botanic Garden are nestled right on the edge of Prospect Park, one of Brooklyn’s most loved public parks. The gardens are free to visit on Saturdays before noon, so we took advantage of the weather and went for a stroll. The greenhouses at the gardens were great. I particularly enjoyed the display of bonsai trees. They’re so little and cute! Of course I had to walk the Brooklyn Bridge before I left. Classic bridge shot. Mil and I will be taking the week between Christmas and New Year’s off, so this is our last post before 2016! Merry Christmas and happy holidays to you and your families. See you in the new year! Right after college I moved to New York City like any good twenty-something with dreams. My first year in the city was full of new experiences: Shakespeare in Central Park, sweaty subway rides, street fairs, and pop-up fruit carts serving mangos drenched in hot sauce. As soon as the temperature heats up around April, ladies with their mango and pineapple stands begin popping up on street corners. Their offerings are simple: diced tropical fruit topped with hot sauce, lime juice, and salt. It took me a while to give the topping a try, but once I did an almost daily habit was begun. 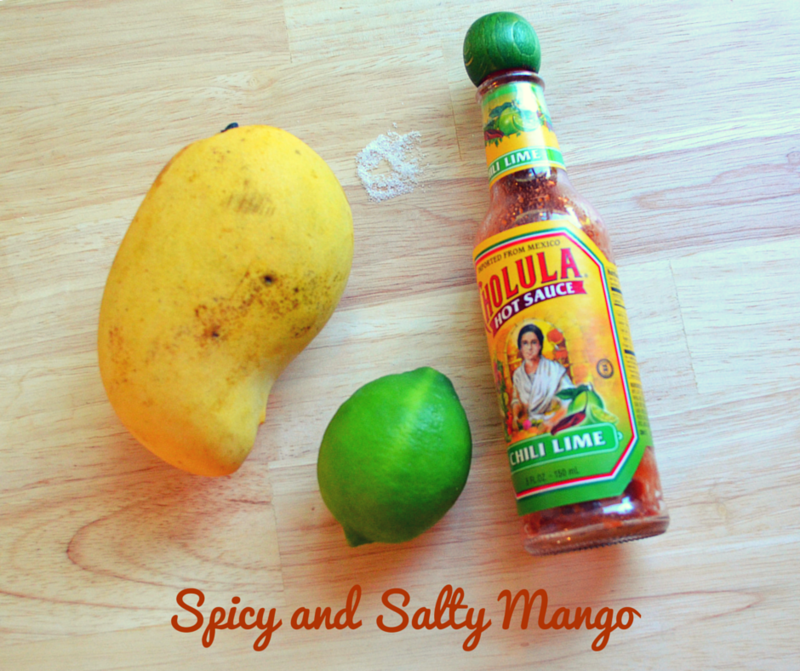 The salt brings out the sweetness of mango and the spice adds just a little pop to the flavor. It sounds a little crazy but is SO good. This weekend’s 80 degree weather, combined with Fred Meyer’s sale on mangos, was enough to rekindle the craving. Here’s the “recipe” so you too can give this crazy combination a try! 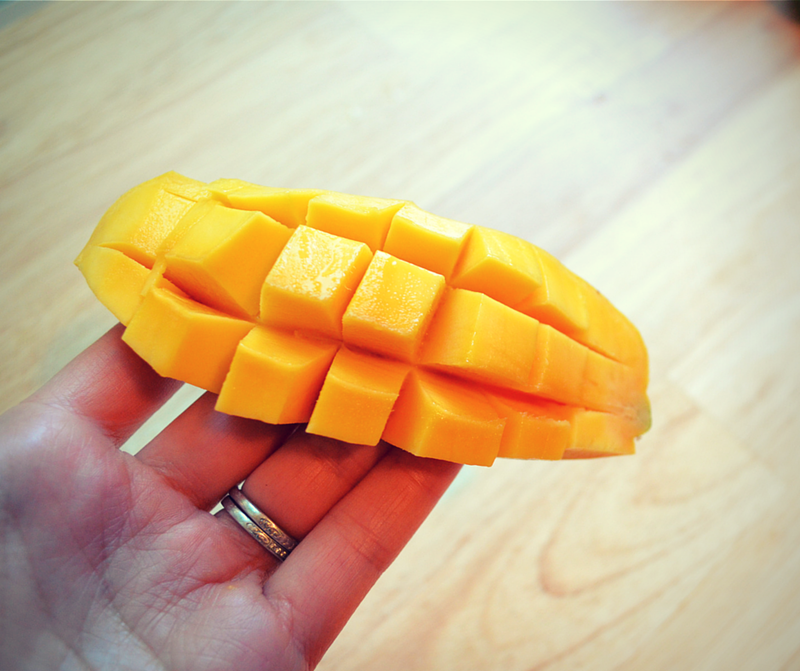 Directions: Peel and cut your mango into slices or cubes. Here’s a good tutorial. It can be tricky if you haven’t done it before. Arrange on a plate or in a bowl. Squeeze the lime juice on top, add a few shakes of hot sauce, and a sprinkle of salt. Stir around a little bit to mix the flavors and dig in! 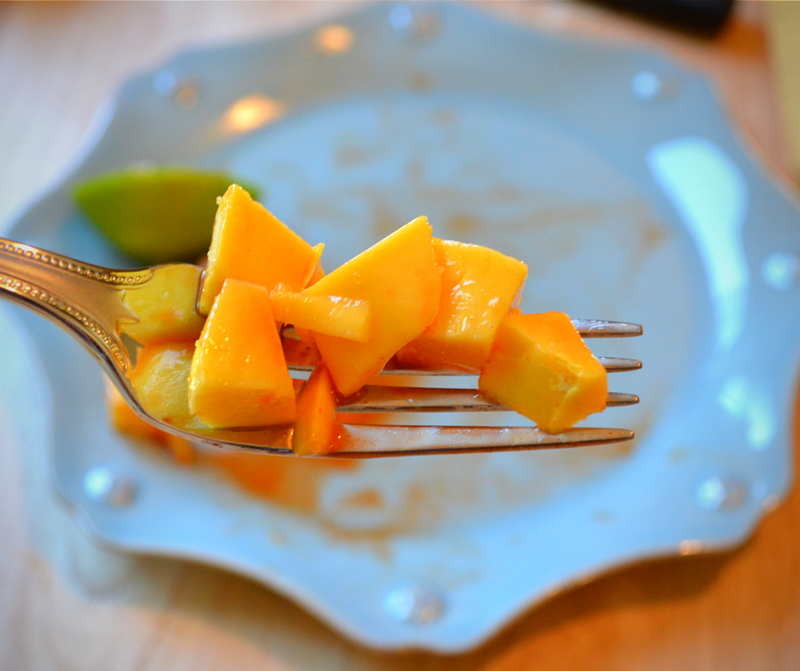 I ate this mango so quickly that I forgot to take a picture until the second to last bite!